Care must be taken to avoid advanced waste management becoming the privilege of the few. The purpose of this article is to outline the major trends and challenges that will shape the future of waste management for the next few decades. Although in our complex and unpredictable world ‘prediction is very difficult, especially about the future’ (Niels Bohr), there are certain trends and facts that more or less create the ‘bigger picture’ in which the waste management industry will evolve. Interestingly, discussion of these trends has not up till now directly linked them with waste management – at least not according to the author’s knowledge. E-Waste: South Africa&apos;s Next Gold Rush? Landfill Mining: Goldmine or Minefield? Putting these trends together and considering the consequences they will have for waste management, it is clear that new challenges are emerging, and the current situation must be seen in a different way. Our waste management systems and our market conditions, even at their best, are incapable of handling the growing amounts of waste globally. So unless a new paradigm of global cooperation and governance is adopted, a tsunami of uncontrolled dumpsites will be the prevailing waste management method, especially in Asia. Amounts of waste are largely determined by two factors: first, the population in any given area, and second, its consumption patterns – which are controlled by the evolution of Gross Domestic Product per Capita (GDP/c). According to the UN, between now and 2025, the world population will increase by 20% to reach 8 billion inhabitants (from 6.5 today). Moreover, by 2050, the total population will be around 9.5 billion, unless specific control measures are broadly adopted. If this becomes a reality then a population of 8-8.5 billion in 2050 may be considered a successful stabilization of numbers. It is important to note that 97% of this growth will happen in Asia and Africa, which includes some of the poorest countries that have the least capability to absorb it. After 2025 it is expected that Asia will hold more than two thirds of the world’s population. This growth also will boost urbanization of the population (urban population is expected to be around 65% of the total one after 2040), and the creation of extended zones of poverty around and inside megacities. The number of inhabitants of slums will be double around 2025 and will reach 1.5 billion. Besides overpopulation, a remarkable increase in GDP/c especially in developing countries is on its way. In 2025, world production will have doubled in relation to 2005. By 2050 the world production may again have doubled compared to 2025. The global average GDP/c around 2025 will be more or less one and a half times the current one, and in a business-as-usual scenario it may be fourfold around 2050. Jeffrey Sachs has estimated that in developing countries the GDP/c will be around $40,000 in 2050, which is the same as the USA GDP/c in 2005! It also seems that we are living in a richer world where we will have higher actual numbers of poor people, but less in terms of percentages. Obviously, both the increase of the population and the remarkable growth of global GDP/c will drive an increase in waste volumes. And although it is out of the scope of this article to estimate the waste growth expected, it will definitely be huge. Just to give an idea, using macroeconomic data from 30 Organisation for Ecomonic Cooperation and Development (OECD) countries it has been estimated that a 1% increase in national income creates a 0.69% increase in municipal solid waste amount. Question 1: Will the expansion of modern waste management systems be capable of handling the increasing amounts of waste generated? Or will the reality be an ocean of new uncontrolled dumpsites, with some islands of advanced waste management but a continent of landfills? Question 2: How will those advanced technologies become available for countries that are trapped in poverty? Because not all countries will benefit from the global GDP/c growth and the outsiders, for the time being, are more than one billion. And it seems that the gap between those poor countries and the rest of the world is set to grow wider. The first will be due to changing food culture and habits in developing countries. As GDP/c goes up, it is expected that by 2050 the demand for agricultural goods will rise by 70% and the demand for meat will double. Besides the serious issues related to food production and sustainability, those changes will change the waste composition in a large part of the world. The organic fraction will be more dominant in MSW, more agricultural and meat waste will create new problems that have to be faced. And of course, such a change in waste composition makes the greenhouse gas challenge for waste management more difficult than it is already. It has been estimated that urban food waste is going to increase by 44% globally between 2005 and 2025. During the same period, and because of its expected economic development, Asia is predicted to experience the largest increase in food waste production, from 278 million to 416 million tons (252 million to 377 million tonnes). If present waste management trends are maintained, landfilled food waste is predicted to increase world CH4 emissions from 34 million to 48 million tons (31 million to 43 million tonnes) and the landfill share of global anthropogenic emissions from 8% to 10%. The rapidly growing stream of electronic waste (WEEE) which is already a big problem, and directly related with the crime of waste trafficking. As the world becomes more and more networked and interconnected, and as electrical and electronic products, including PCs, gadgets, digital cameras, pervasive computing etc., are rapidly devalued and become waste due to fast update and built-in obsolescence, the WEEE stream will become a major challenge of future waste management. The second is the stream of nanomaterials that are coming slowly but steadily. Nano-bio and e-technologies will create a whole spectrum of new artificial materials. Major breakthroughs within the next two decades will provide inexpensive ways to produce mass quantities of those materials. In addition, the function of such materials will move from ‘passive’ to ‘active’ with the integration of nanoscale valves, switches, pumps, motors and other components. Obviously, the willingness to throw them away will increase as they become less and less expensive. The main trend in consumer goods will be the personalization of them, which on the one hand will create products that are more difficult to throw away and on the other hand will make reuse much more difficult. The plethora of new products will be rapidly expanded, consumed and finally transformed to new waste streams. So clearly time is a factor here. First, new products are launched, consumed and transformed into new kinds of waste before an effective waste management solution is established for them. Most of the time, problems with managing new kinds of waste emerge after the product has been consumed. Second, the time taken to establish a new separate waste stream network, or a new technical solution for the new waste stream, generally is by far longer than the lag-time between production of a new product and its transformation to waste. Question 3: Is our waste management system capable of handling the plethora of new kinds of waste? Are the current social, political and financial conditions sufficient to resolve the problem of the growing complexity of waste streams? Let’s try and answer this below. What is the best we can do? Before addressing the questions raised, it is necessary to look at the best example of waste management worldwide, not in a country or a region but in a broader geographic unit, such as a continent, or at least a big part of it. This is necessary in order to avoid the mistake of generalizing any local or even national advanced waste management systems, or any disadvantaged ones. From that perspective, I consider the European Union as the most advanced continental waste management system. Waste management must become more environmentally sound. Examining the best system’s successes and failures will provide a useful insight for a global strategy on waste management. Clearly, the EU is going forward to a better, more expensive and more environmentally sound waste management system. Landfills and methane emissions have been remarkably reduced, despite some national exceptions, MBT and WTE facilities are expanding in all their forms and recycling has become a major trend with substantial results. But there are some issues to discuss. From 2000 to 2008, the European exports of plastic waste rose by 250%, reaching 2.27 million tones – approximately 5 million tones are annually recycled in Europe. Around 87% of these exports are going to China, including Hong Kong. The global financial crisis seems to have worsened the situation, as the first quarter of 2009 saw a 33% increase in exports compared to the previous year. Between 1995 and 2007, the amount of non-hazardous waste exported to Asia increased tenfold for waste paper, elevenfold for plastics and fivefold for metals. At the same time, just for a comparison, the amount of paper and cardboard packaging waste recycled has increased from about 24 to 30 million tons (21.7 to 27 million tonnes) and the amount of plastic packaging recycled has increased from about 10 to 14 million tons (9 to 12.7 million tonnes). Speaking of hazardous waste streams, the crime of illegal waste shipment and waste trafficking is something that is getting even worse during the current financial crisis. Exporting waste illegally to poorer countries has become a vast and growing international business, as companies try to minimize the costs of new environmental laws that tax waste or require that it is recycled or otherwise disposed of in an environmentally responsible way. And more than 20 million containers of waste are now shipped each year, either legally or illegally, from the EU to non-EU countries. As has been already successfully noted ‘it is four times as expensive to incinerate trash in the Netherlands as to put it – illegally – on a boat to China.’ And the vast container ships that arrive in Europe and North America from Asia filled with cheap garments and electrical goods, now have a profitable return cargo: waste like steel cables, circuit boards and leftovers from last night’s pasta meal. So let’s think about how successful EU waste management would be without China and Asia to absorb both legal and illegal waste shipments? What would be the current recycling levels without Asia to receive such huge amounts of recyclables? 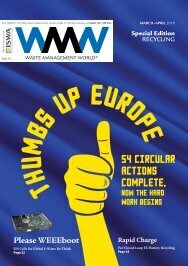 Is our European waste management system even capable of facing the WEEE problem? And how self-sufficient actually is the best waste management system in the world when it depends so much on a global (legal and illegal) trade of waste and materials? Well, each person can answer those questions according his or her experience, but I think that the best system we have has not been proved to be capable or self-sufficient enough to face increasing volumes and rapidly changing composition of waste. And to show that this is not just a European problem, there is another example of failure of advanced waste management systems: the increasingly recognized problem of plastic floating landfills. Millions of tonnes of plastic waste are floating around Pacific Ocean. It is estimated that more than 80% of this waste is coming from land-based resources and the rest from marine-based resources. And a closer view of the possible land-based resources includes the USA and Japan, which certainly are considered to be advanced waste management areas compared to the vast majority of the world. Now we can try to answer our three big questions. the development of advanced infrastructure is, and will be, expensive for many years for most of the countries that need it the most, the required infrastructure, even when the financial resources are available, is delivered much slower than the rapid growth of waste generation, and, the current waste management systems are not capable of jumping from open dumps to high-tech systems. So thinking globally, the massive development of new sanitary landfills is the only realistic and achievable option for a universal step forward and even this will be difficult in some cases. Question 2 refers to the poverty trap and the ways to overlap it. It is more than clear that unless we find new and more effective paths of global cooperation, or even global environmental governance according to some people, our globalized market is not capable, nor in favour, of facing the waste management issues in the poorest countries. The governments of developed countries and their residents must understand that having one billion people in the worst social, food, water and hygienic conditions is a permanent and increasing threat for their own living standards. And even if one believes that the control of global refugee streams will be successful (which is not the case in my opinion), environmental pollution and pandemics clearly have no borders, as we have experienced during last few years. The necessity for a new global waste initiative is more than obvious, and the lack of any relevant action is more than ridiculous. The poverty trap of the poorest countries may be easily transformed to a global growth trap. Last but not least, I come back to Question 3, regarding the global capacity to confront the plethora of new waste streams. The paradigm of WEEE is a representative one. Although the WEEE market has almost doubled between 2002 and 2009, the problem has not really been addressed and illegal, dangerous and sometimes criminal practices are the dominant methods for their management. Once again, the current market conditions and initiatives are not capable of finding an environmentally-sound solution for a problem that rapid e-market growth has created. Unless global minimum standards for waste management are established, the driving forces for waste trafficking and criminal practices will be further strengthened when quantities of new waste streams increase. If this is not enough, the recent downturn of recycling programs due to the global financial crisis is proof of the market’s incapability when it comes to sustaining recycling and recovery activities. Once again, we need another type of global cooperation which will provide a different framework for market-driven actions combined with strong environmental governance. Another important consequence is that as new waste streams are coming, they will need more new different waste management networks for recovery and recycling purposes, thus the complexity of waste management will exponentially grow. Our world will be overpopulated and more and more interconnected. The defining challenge of the 21st Century will be that humanity shares a common fate. That fate is already demanding new forms of global cooperation. The paradox of a unified global economy and divided national societies poses the single greatest threat for our planet. And although there are appropriate waste management solutions, the main problem is the global framework that should put them in place where they are most needed. Let’s try to create it. Recycling has come a long way since 1990. Driving much of this has been a combination of the policies implemented by many governments around the world, innovative new sorting and processing technologies and market forces. But what will the policies, practices and technologies look like in 2035? 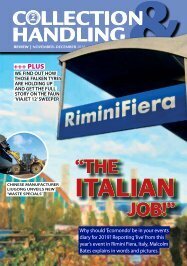 WMW asked some industry leaders for their views.